On Sat 20th Sept 2008 I successfully graded for my 2nd Dan Black Belt in Aikido. 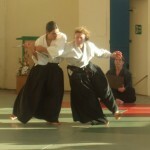 Several members of Bridport Aikido Club, including myself, travelled up to Oldham (near Manchester) on Friday. The journey is 255 miles but it took us 8 hours due to bad traffic. We then did two and a half hours of training with Sensei Kolesnikov, the 6th dan principal of the school. Then the others went for an Indian meal but I didn’t want to do that because I wanted my guts to be in good form for the grading the day after. So I had spaghetti al pomodoro and some mineral water at an Italian restaurant with my good friend Georg who was going for his 1st dan on Saturday – he flew over from Austria specially to do his grading. I had a relaxing bath and went over the moves in my head and visualised a positive outcome to each section of the grading and saw Sensei Kolesnikov saying “Jake Birkett – 2nd Dan” at the end of the grading. I find this sort of thing is good for building confidence and banishing negative self-defeating thoughts. Lots of sports-people do it. I had a good night’s sleep in a cheap hotel in Manchester, ate some museli and toast and had a cup of Clipper organic decaff tea that Georg had bought. Then we got the bus to the dojo. Then the results were announced and I took part in a two hour high grade course. Finally (after a bit of Sat Nav generated chaos) we finally arrived at the social meal in a Chinese Buffet restaurant in Manchester whereupon I ate like a horse. This was followed by a poor night’s sleep on the floor at a friend’s flat in Manchester (I let my students have the comfy beds), another three hour high grade course on Sunday, and then a six hour drive home. It was quite tiring, and my legs ached from all the kneeling, but it feels very good to have passed. I’ve been training for 2nd dan for 6 years for since my 1st black belt which took 5 years to obtain – so that’s 11 years in total. I don’t have to do any more gradings now because 3rd dan and higher are awarded as honorary ranks depending on how long you’ve trained for and what you do for the organisation. This entry was posted on Tuesday, September 23rd, 2008 at 3:39 pm and is filed under My News. You can follow any responses to this entry through the RSS 2.0 feed. Both comments and pings are currently closed. Congratulations! A good friend of the family is several dans in (I forget sadly.) He can do some amazing things defending himself while kneeling. So I have some understanding the long and difficult journey you’ve taken. You must be on cloud nine. Woot! Congratulations Jake, I can remember taking my 1st dan in Ju-Jitsu many years ago and remembering how hard that was. well done you deserve it. @MrPhil: Yeah I had to do a selection of kneeling moves. They are very powerful ecause your centre is so low down. A friend of mine got the first black one. I think it’s a really cool kind of sport… might check it out.